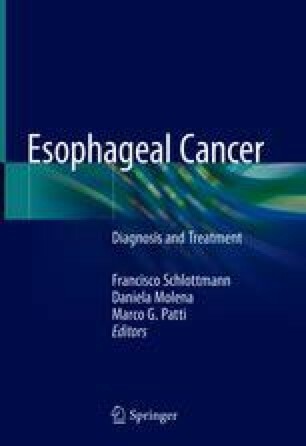 Over the past 40 years, the incidence of esophageal adenocarcinoma (EAC) has increased more than sixfold in Western countries. The increase incidence of EAC has been attributed to the rising prevalence of obesity and gastroesophageal reflux disease (GERD). GERD affects an estimated 20% of the population in the US, and its prevalence is increasing worldwide. About 10–15% of patients with GERD will develop Barrett’s esophagus (BE). This metaplastic lesion due to the chronic injury produced by repeated reflux episodes involves genetic mutations that can lead to a malignant transformation. The development of EAC is characterized by the progression from BE metaplasia to dysplasia, and ultimately invasive carcinoma. GLOBOCAN 2012: Estimated cancer incidence, mortality, and prevalence worldwide in 2012. Available at: http://globocan.iarc.fr/Pages/fact_sheets_population.aspx. Accessed 11 Jan 2018.